As smooth and suave as George Clooney and Brad Pitt make burglary look in Oceans 11, the reality is most would-be heists don't go down quite as planned. Take, for example, the case of a man in Alabama, whose recent attempt to burglarize a local Waffle House ended with him pantsless and crashing through the ceiling into a dining room full of bewildered customers. 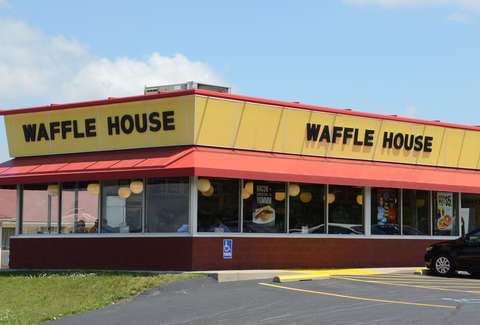 The botched crime went down last Sunday at a Waffle House in Tuscumbia, Alabama, when a man attempted to break into the office of the restaurant via the bathroom ceiling and wound up crashing into the dining room without pants. As for how he wound up in his undies, a police report alleges that he took his pants off in the bathroom and used them to tie up the door in an effort to prevent anyone from coming in, per a story in the Times Daily newspaper. “He was trying to break into the office of the restaurant by going through the ceiling of the bathroom,” Police Chief Tony Logan said in an interview with the Times Daily. “Apparently, he made a wrong step and he came down into the dining area." In addition to making a mess of the ceiling, the man also reportedly damaged both the sink and toilet in the bathroom. When the ceiling gave way and he landed in the dining room, customers attempted to restrain the man, but he was able to fight them off and flee to a getaway car in the parking lot. That car then led officers who responded to the scene on a chase before both the driver and the suspect ditched the vehicle in a local park and ran off. He wasn't hard to identify though, particularly since his ID was in the pair of pants he left behind. Now, a warrant for first-degree criminal mischief and burglary has been issued. The man, who was believed to have been on drugs at the time, is still on the run. It's also unclear whether he's found a new pair of pants.